It is unusual for the names of Directors Howard Hawks and John Carpenter. Actors Peter Cushing, Christopher Lee, Kurt Russell and Kenneth Tobey to be mentioned together, but in this article they have one "THING" in common and that is a pun. 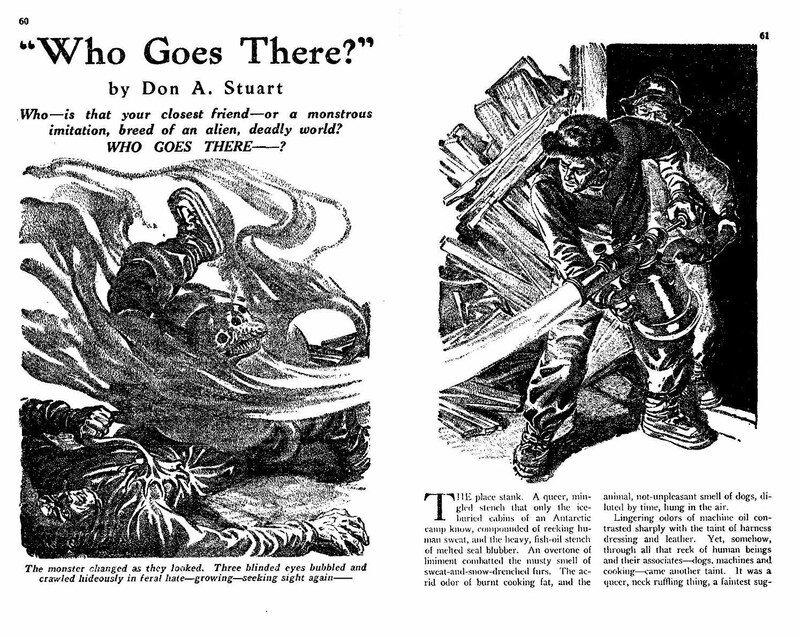 The "Thing" in question is really a novella from 1938 entitled "Who Goes There?" by John W. Campbell, Jr. This is a look at FOUR Science Fiction/Horror films made from Campbell's work. the most powerful force in science fiction ever, and for the first ten years of his editorship he dominated the field completely. "Who Goes There?" is an excellent science fiction story and I highly recommend it to my readers. It tells of a group of scientists in Antarctica that discover a space craft with it's four foot tall occupant frozen in it. The story then gets into the possibility that "The Thing from Another World", the line is in the novella, may be alive. It is able to change shapes and telepathically communicate with each of its human duplicates. Then there is the question of who among the 32 members of the research station are not human anymore? Which of the now two groups will first become 17 and therefore control the fate of both the station and the world? Bringing up the added question of what does "The Thing" want on Earth? All of the above questions are found within a tightly written, highly dramatic and made probable science fiction story by Campbell's written words. So what did Campbell's thing look like? Here is the cover of the "Classics Illustrated" comic book showing the four foot tall alien as he first described it. The screenplay for this classic Science Fiction motion picture was credited to Charles Lederer. For gossip his Aunt was Marion Davies the mistress of newspaper publisher William Randolph Hearst. Davies raised the boy after his parents divorced and would have nothing more to do with him. Charles Lederer married Virginia Nicolson in 1940 after she divorced his good friend Orson Wells the same year. Some of Charles' other movie credits include 1953's "Gentlemen Prefer Blondes", 1957's "The Spirit of St. Louis" and the original "Rat Pack" 1960 version of "Ocean's Eleven". Two other names are associated, but without on screen credit, with the screenplay. Ben Hecht was one of the greats of screenplay writing. He was also a journalist and novelist, but his motion picture credits contain the original 1932 "Scarface", Alfred Hitchcock's 1945 "Spellbound" and 1946's "Notorious", Carlo Ponti's 1954 "Ulysses". Where he adapted Homer's "The Odyssey" for a movie starring American actor Kirk Douglas. Hecht also wrote the original story "Queen of the Universe" that was turned into the 1958 cult Sci-Fi classic "Queen of Outer Space". The other screenplay contributor, as with all his films, was Howard Hawks. Scenes like the opening Poker Game have his signature character dialogue. As one character starts talking over another character's lines giving a realistic touch to the conversation within Hawks' crisp dialogue. The first time credit for directing a feature film went to Howard Hawks' long time cameraman Christian Nyby, but there are three views on who actually directed "The Thing from Another World". On holds that it was only Nyby. The counter opinion focuses on scene composition indicating within some of the shots there is the known look of Howard Hawks. As Christian Nyby's defenders point out. After being Hawks' camera man for so many years. It is logical that Christian Nyby should have been aware of how Hawks shot certain types of scenes. Then there is the story that Hawks did not want his name associated with directing a low class of motion picture such as science fiction. As nobody knew he helped write the screenplay. The only place his name would be was producer and that made sense for Hawks backing Christian Nyby's directorial debut. So Howard Hawks gave Nyby's the director credit, but had performed the work himself. The third idea is that it was actually a joint directing, but again Howard Hawks wanted his friend Christian Nyby to receive all the credit. This writing team used the first 31 pages of John W. Campbell, Jr's novella for the basis of their screenplay. The five major changes to "Who Goes There?" start with the location. We are now at the North Pole and not Antarctica. Next is a change to the discovery of the spacecraft from one that already crashed to Earth millions of years ago to one that only crashed a few days prior and was photographed. First being thought to be a meteor, but its sudden changes in direction speaking to something entirely else. The way the alien looked was impacted by the low budget of the production as stop motion animation was considered, but originality comes through over how this alien compares to humans. Lastly the tight screenplay placed all of the research personnel in one building rather than the multiple locations in the novella. Campbell had used the design to create more terror and mystery as the story progressed, but really doesn't come into play until after page 32. The number of people at the now North Pole research center are reduced from 32 to 16 including the arrivals on Captain Patrick Henry's plane. Two of these characters become women Mrs. Chapman and Nikki Nicholson. Playing Captain Henry was Kenneth Tobey in his first of three classic 1950 science fiction motion pictures. The other two were both from Stop Motion Animator Ray Harrhausen. They are 1953's "The Beast from 20,000 Fathoms" and 1955's "It Came from Beneath the Sea". In "The Thing from Another World" the audience learns that there is a past between Captain Henry and Nikki Nicholson. The relationship is created through the use of many innuendo's in the script starting with the Poker Game and is a trademark of Howard Hawks. As are the director's strong female characters in what was essentially a 1950's man's world. Look at newcomer Angie Dickinson in his western classic "Rio Bravo" as another of his examples. Another off camera reason for Margaret Sheridan, as Nikki. getting top billing in the picture was that she was Howard Hawks' girl friend at the time. However, in her scenes opposite Tobey there is a chemistry that sends sparks flying and throughout the motion picture Sheridan gives one of the strongest performances. In Howard Hawks version of the Campbell novel. The alien played by actor James Arness turns out to be a plant, or as surprised Reporter Ned "Scotty" Scott remarks "An Intelligent Carrot". Doing away with the duplication of members of the Research Group. The idea of "The Thing" being a plant leads to it containing seed pods to repropagate it's species and conqueror the Earth. An idea picked up and reworked by Jack Finney for his 1955 novel "The Body Snatchers". The Research Team Head Dr. Carrington's was played very understated by Robert Cornthwaite. My reader must remember that 1951 was only six years after the first Atomic Bomb test and dropping of two atomic weapons on Hiroshima and Nagasaki. Many American's and Congress at the time became leery of the motivations of scientists as a result. Dr. Carrington is portrayed very much like those Los Alamos Scientists who created the Atomic Bomb as pictured in the minds of many Americans. He sees science and its discoveries as the ultimate goal and overlooks the associated dangers. This comes into play in his interaction with Captain Henry. Henry is a military man looking at the cold facts of reality in relationship to the now alive alien. An example of Dr. Carrington's scientific curiosity overtaking the consequences of his actions comes in the above photograph of the seed pods. Carrington does not see the danger in growing more "Things". Which in turn becomes more invaders capable of reproduction. However, J. Robert Oppenheimer had recently testified in front of "The House Committee on Un-American Activities" for being an admitted "Communist". A "Red Flag" to many American's at the start of "The Cold War". So the similarities and concerns over the real Dr. Oppenheimer and the character of Dr. Carrington were not lost on American audiences in 1951. Undertones in the screenplay mostly overlooked by today's viewing audience of the feature film. 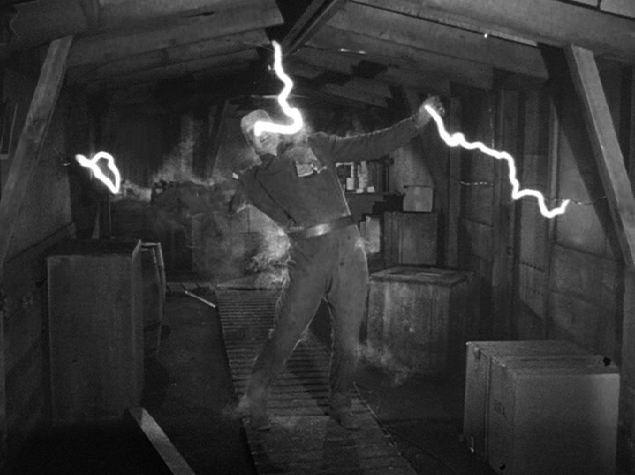 The battle to destroy the alien invader climaxes with an electrical net being set up to destroy it. This idea is taken from the last of those 31 pages of "Who Goes There?". The alien is lured between the electrical net in the motion picture and burnt to a cinder. In the novella those at the Research Facility believe they have killed the alien at this point. In 1951 when "The Thing from Another World" was released. American's were already involved with the UFO (Unidentified Flying Objects) craze. Even the Air Force would became involved with "Project Blue Book" the following year. This all started back on June 24, 1947 when private pilot Kenneth Arnold, who had over 9,000 flying hours, reported seeing nine unusual objects flying in the skies near Mt. Rainier, Washington. The newspapers picked up the story and one coined the term "Flying Saucers". Then Air Force pilots and Airline Pilots started seeing flying saucers. I mean "Weather Balloons". In 1950 the first movie, an independent production, about UFO's was released entitled appropriately "The Flying Saucer". In typical "Cold War" formula the "Flying Saucer" turns out to be an aircraft flown by Soviet Spies in Alaska. Which brings me back to the ending of Howard Hawks's movie "The Thing from Another World". Tell the world. Tell this to everybody, wherever they are. Watch the skies everywhere. Keep looking. Keep watching the skies. The screenplay for John Carpenter's "The Thing" was written by Bill Lancaster the son of actor Burt Lancaster. He is on record as saying that he thought "Who Goes There?" wasn't a great story, but he liked the paranoia and claustrophobic atmosphere of the novella. Lancaster's screenplay takes it's basis from the final 38 pages of the John W. Campbell, Jr. story not used by Charles Lederer and Howard Hawks. An obvious change to "Who Goes There?" is the need to get John Carpenter's story to that point in the novella for the audience. Lancaster's screenplay first shows the alien flying saucer crashing into the Earth perhaps centuries in the past. This is carried through by the character of Norris, Charles Hallahan, who speculates the flying saucer has been under the ice pack for 100,000 years or more. The screenplay places, as did the novella, the American Scientific Research Installation at Antarctica. Also as written by Campbell this facility contains multiple buildings. Which now come into play with the paranoia story line, starting at page 32, from the novella transferred to film. The story actually opens as a sled dog, played by Jed, is seen running across the snow pursued by a Norwegian helicopter with one of two men shooting at it. As some of the men from the American installation watch in amazement. The helicopter lands and one of the two men in it accidentally drops a thermite charge destroying the other man and the copter. As the surviving Norwegian opens fire on the seemingly innocent sled dog. He is killed by one of the American's and the dog runs for protection to the group. So enters "The Thing" in Bill Lancaster's screenplay. The idea of the sled dog being the alien is in the novella, but as just one of the pack in the kennel. This is prior to the discovery that the alien can duplicate living organisms. Also taken from Campbell's novella is the blood test used to start determining who is and is not an alien duplicate. Additionally from the written story is locking up one of the scientists in a separate building over the belief he isn't human. At page 32 of the original novella the tone of the story changes completely. From page 1 through 31 John W. Campbell presents the reader with the idea there is only ONE alien and by electricity the members of the Research Facility destroy it. In short the basis for 1951's "The Thing from Another World".Then the paranoia that Bill Lancaster liked in the novella starts to take form. As the two leading members of the Research Group, in the novella, wonder if the alien could communicate telepathically? The telepathy concept is not used in Lancaster's screenplay. As is the idea that there are two distinct groups at the base and that once the alien group exceeds the humans by one. They will then control the base and possibly the world as I mentioned earlier. However, Bill Lancaster works this paranoia in a different way very effectively. The major difference between the two motion picture approaches to "Who Goes There?". Is that Howard Hawks creates what could be considered a pure science fiction motion picture with strong political undertones. Similar to what Director Robert Wise did with the Second Coming of Christ allegory of 1951's "The Day the Earth Stood Still". While John Carpenter has created a claustrophobic horror story within a science fiction scenario. There is no place for the men to go and they began to feel trapped within the ice and snow of Antarctica surrounding them. Similar to the paranoiac fear reflected in Don Siegel's 1956 "Invasion of the Body Snatchers", based on Jack Finney's novel, that the person you've known for possibly years is not human anymore and vice versa. After the opening incident with the sled dog and the Norwegian's. R.J. MacReady, Kurt Russell, and Dr. Cooper, Richard Dysart, take a helicopter and go to the Norwegian Research Base. There they discover nothing but death, burnt bodies and the remains of a humanoid corpse with two heads. They bring that back to their station. Along with video tapes shot by the Norwegian's and a player. Apparently the research station has 220-240 volt outlets besides 110-120. When the tapes are played. On the video is a near perfect recreation of the discovery of the flying saucer and its shape from "The Thing from Another World". However, in this version the thermite charges actually did work and uncover the spacecraft. As in the novel Russell and some others forgot about locking Blair, A. Wilford Brimley, up in an outbuilding. The group enters and can't find him, but discover some loose floor boards leading to an underground cave and a small spacecraft under construction. In the novella this is actually the climax of the story. When what appears to be the original alien is found working instead of the scientist. Raising the questions is this shape even the alien's original form and does any of the alien duplicates remember the forms of other assimilated victims? Eventually it appears everyone, but Russell has become an alien duplicate and is destroyed. However, as Kurt Russell, having just blown up the entire base, walks around the camp. He sees Childs, Keith David, appear and the two men, if they are men anymore? Realize that neither knows for sure what they are and in a twist to all that has happened. They just sit down with a bottle of scotch and share it. Knowing they can not escape freezing to death and the movie ends. Giving Bill Lancaster's screenplay an open ending for a sequel which was never made, but then there was that prequel. The problem with a prequel vs a sequel is the audience already knows what's coming and how it must end. Especially when the original was made 29 years prior and has been on television, DVD/Blu-Ray and can be found even on YouTube. This does not mean that a prequel can't be very good, but the producer and director are challenged with creating both a screenplay that catches the audience and covers some of the ground of the first motion picture for clarity. Meaning that you must give that audience something they do not know and want to know. This 2011 motion picture has three titles depending upon where it was shown: "The Thing". "The Thing: the Beginning" and "The Thing Awakens". The last two going directly to the prequel concept for John Carpenter"s 1982 motion picture. Look at the writing credits for the prequel and you see two entries. One says "Based Upon John W. Campbell, Jr's 'Who Goes There?'". Which is a requirement and the second entry reads screenplay by Eric Heisserer. Heisserer wrote the screenplay for the remake of "Nightmare on Elm Street" and the one used for "Final Destination 5" before this production. Question? As this film involves the events not seen in John Carpenter's 1982 feature. Shouldn't the "Based Upon" line also mention Bill Lancaster, primarily, because it is his screenplay not Campbell's novella that is being restructured for this picture? The first possible problem in the script comes with the introduction of Kate Lloyd, Mary Elizabeth Winstead, and Adam Finch, Eric Christen Olsen, into the story. According to Bill Lancaster's original screenplay and the information given to the 1982 audience. The previously unnamed "Thule Station" is all male and all Norwegian. One of the problems facing those in Carpenter's film is reading the Norwegian language documents that were recovered. The person who recruits Winstead's Kate Lloyd is Dr. Sander Halvorson, Ulrich Thomsen, a Danish scientist. The characters in Eric Heisserer's screenplay also contain an Englishman, a French women and an American Vietnam Veteran helicopter pilot. I will admit there could have been other nationalities at "Thule", but that is not what is implied in the John Carpenter motion picture. It's a really fascinating way to construct a story because we're doing it by autopsy, by examining very, very closely everything we know about the Norwegian camp and about the events that happened there from photos and video footage that's recovered, from a visit to the base, the director, producer and I have gone through it countless times marking, you know, there's a fire axe in the door, we have to account for that…we're having to reverse engineer it, so those details all matter to us ‘cause it all has to make sense. At the films start we find out that Kate Lloyd is a paleontologist from New York's Columbia University. We see her working on a skeleton when Halvorson and Finch enter. They explain whats going on at "Thule Station" and Adam asks if she wants to go there. Kate immediately says yes, leaves all her work in progress, and we next see the three in a helicopter flying over the snow. Lloyd, Finch and Halvorson are shown the spacecraft and have to enter through an ice cavern to see get to it. Which is fine as it is underground having been discovered by a group of men in a caterpillar vehicle that breaks through the ice as they are hanging facing downward. Problem is that in Carpenter's 1982 film the flying saucer is above ground in a depression made by its impact to the Earth. Next the three new arrivals are told of the discovery of an alien from the craft. So what does "The Thing" look like? In "Who Goes There?" we are told it's blue skinned, has three red eyes and is tentacled. In "The Thing from Another World" we have the humanoid plant person and in 1982 we have the already changed dog and don't know what was originally encased in that block of ice found at the Norwegian base. For the prequel the audience gets to see what the alien was supposed to look like when it crashed on Earth and was immediately frozen. It's a giant bug bringing out the discussion as in the John W. Campbell, Jr novella over the real shape of the original alien. Another question raised is how could a bug fly the craft and again that harks back to Campbell's idea of an alien that can become any shape required after absorbing that life form. As in "The Thing from Another World" the alien escapes it ice prison and the game is afoot. There is an immediate confrontation with the alien while the scientists are celebrating their great find. It attacks a dog and two of the Research group find the creature, but it grabs one of them and starts to absorb him. The others arrive and the alien is set on fire and killed, or so everyone thinks. Some of the transformations from "Human" to "Thing" are better looking than the original, but in the age of CGI the filmmakers decided to make them look as close as possible to the style of the 1982 movie. This was meant to maintain continuity between the two movies. While there was originality to the new transformations a few reviewers thought the CGI detracted from the effect as compared to the make-up transformation work of Rob Bottin and his staff in the original feature. I would add that if you are making a prequel to John Carpenter's film. You should have wanted to make your transformations look more closely to Bottin's rather than creating new unseen ideas. Story wise instead of the blood test of both the novella and the 1982 motion picture. Kurt Russell, oops, I mean Mary Elizabeth Winstead, now taking charge, goes to the station's blood bank to determine who is and who is not human, but discovers the blood has been contaminated. Why she doesn't come up with the same blood test after learning of the contaminated blood is not considered. Then we come to another problem with the story. The group wants to send a helicopter to the closest base for help. That would be apparently the American one from the Carpenter film. However, Kate Lloyd argues that "The Thing" may have turned members of the group into aliens and they can not risk sending anyone out of the base. This is straight out of the novella and part of the paranoia aspect of the story and the 1982 film. The missing question here is why somebody didn't just attempt to call on the station's radio for possible help, but also warn the American's to be careful of any new arrivals. Be they human, or animal. They must obviously be within sending range. but that would probably have let the two Norwegians seen shooting at the dog at the start of John Carpenter's film kill the dog and perhaps the Americans join in. My reader might be telling me "Hindsight is Great", but according to Eric Heisserer the two producers, the director and himself took the time to be sure their 2011 prequel matched the 1982 original. The film has a double ending. First the audience sees Kate Lloyd and Sam Carter, Joel Edgerton, confront each other. Kate gets Carter to reveal himself as an alien and she kills him, Next she gets in the cab of one of the snow caterpillar vehicles, closes and locks herself inside and stares blankly at the screen as the windshield wipers move back and forth. The screen fades to black and then we hear the sound of a helicopter as the end credits start to role. Off and on the credits cut back and forth with the closing action of the picture. We see the helicopter landing with Matias, Ole Martin Aune Nilsen, at the controls. A rifle comes out of a hut and somebody starts shooting. It is Lars, Jorgen Langhelle, and he stops and has Matias open his mouth to reveal fillings. The alien can only absorb living tissue and has been spitting out fillings and other metal objects. As this is happening a sled dogs runs by and Lars starts to shoot at it. The two men enter the helicopter and go after the dog and we have the lead into the John Carpenter film. The ending of this picture and the arrival of Kurt Russell and Richard Dysart at the Norwegian base in the 1982 motion picture leave two more questions unanswered. 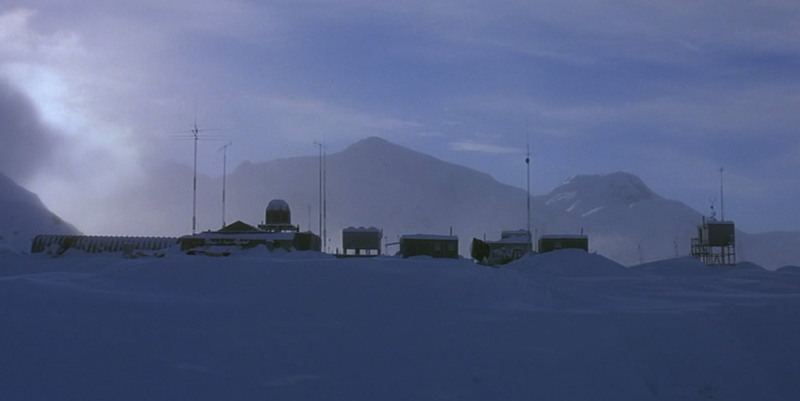 In Bill Lancaster's screenplay the film ends telling the audience that the last two survivors of the American base will freeze to death as either humans, or aliens. The scene with Mary Elizabeth Winstead while dramatic doesn't tell the audience if she will live, or die? For that matter is she human, or alien? When the credits roll, with the incidents between Lars and Matias, Kate Lloyd is nowhere to be seen. Conversely when Russell and Dysart walk around the Norwegian base she is also nowhere to be seen, or her vehicle. What become of her? This is an interesting British-Spanish co-production produced by American Bernard Gordon and Spanish producer Gregorio Sacristan. It stars British horror icons Peter Cushing and Christopher Lee. It features American actor Telly Savalas in a cameo roll. The picture is based upon the novella "Who Goes There?" with some very interesting twists and turns. "Horror Express" is also known by the Spanish title: "Panico en el Transiberiano (Panic on the Trans-Siberian Express). The first couple of twists to John W. Campbell, Jr's 1938 novella come with the year and location. The year is 1906 and the picture begins in China and as the train travels the story will enter Czarist Russia. Professor Sir Alexander Saxon, played by Christopher Lee, makes a discovery in a Manchurian cave of an ape like humanoid encased in ice. Cut to Saxon having the creature in a crate waiting to be loaded onto the Peking to Moscrow Trans-Siberian Express. While Professor Saxon is taking care of a problem with his reservation. The crate comes to the attention of a thief who specializes in picking locks and opening safes. The thief is found dead next to the crate and strangely to a policeman who knows him. The thief's eyes are now those of a blind man. 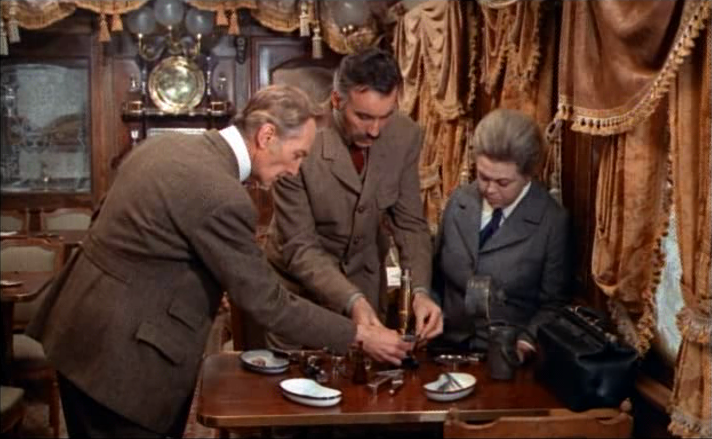 Also boarding the train is a friendly rival Dr. Wells, played by Peter Cushing. The two men will eventually join to fight the alien presence that is killing the train's passengers. All the elements of the novella are in place in this excellent film. The screenplay by Arnaud d'Usseau and Julian Halevey closely follows the original work with just a touch of the Howard Hawks 1951 movie thrown in. Instead of an alien and a flying saucer frozen in ice. The audience has Saxon's humanoid frozen in a prehistoric Manchurian cave. Next they experience the claustrophobic environment of the fast moving train instead of an isolated snow bound research facility. As in the novella the alien life form can move from one person to another. At one point Lee and Cushing believe the yet as identified alien has been killed by a police inspector after the Ape humanoid killed a woman. When the life form has actually moved into the police inspector. One of the added elements is if the "Thing" gets off the train in any form. It becomes free to take over Moscow, the Russian Far East, or by connecting trains Mongolia, China and Korea. This screenplay blends Czarist Russia with Outer Space Alien Invasion. We have a Russian Orthodox Church Monk who believes Saxon's crate to be pure evil. He was present after the thief was killed and could not put a chalk marked cross on the crate the thief was lying next too, because the Monk believes it's the work of the Devil. This character adds a religious element to the story not mentioned in the novella, or the three motion pictures I have written about above. Unlike the other passengers the Monk will permit himself to be taken over to save his new master the alien. Dr Wells and his assistant perform an autopsy on one of the victims and discover the creature wipes the person brain completely clean through their eyes. Thereby gaining that person's entire knowledge. The audience has seen this used by alien in Ape form. When the alien picked the locks on the crate to escape as if it was the thief. Professor Saxton. Dr. Wells and his assistant discover that images are retained in a fluid within the apparently sightless eyes of the creature's victims. This leads to finding out it is not of this Earth. The original creatures eye fluid reveals a prehistoric Earth and what appears to be the alien's arrival on the planet 2 millions years prior. Saxton and Wells theorize that they are dealing with an entity that possessed the original creature found in the Manchurian cave and is now loose on the train hiding as somebody else. The questions become how to prevent more deaths and stop "The Thing" for good. Meanwhile the train is stopped and a brutal Cossack officer, played by Telly Savalas, and his men board it to look for rebels against the Czar. When he is told about the alien he thinks both Lee and Cushing are madder than he appears to be. However, this changes very quickly. This leads to the climax as the alien possessing the Monk's body kills Savalas and all his men. Then confronting Professor Saxon explains how it came to Earth and its plans. Saxon has determined that the creature must kill in the dark and is sensitive to light. Using light he saves the Countess whose husband was just killed, but then the Alien within the Monk has a surprise for Saxon, Wells and the Countess. He brings all his victims back to animated life and they start to go on a killing spree. Wells has been able to get all the living train passengers into the car closest to the tender and while being chased Saxon and the Countess just make it. The train is decoupled and the cars carrying the alien and his victims goes off a cliff bursting into flames. Yes, this is not as straight forward as any of the other three versions of Campbell's novella, but it is just as exciting in an old fashion way.While Christopher Lee and Peter Cushing are in top form.